Tryon Park is a Park operated by Monroe County and located in Irondequoit on 82 undeveloped acres. See also the nearby Tryon Park West for more organized athletic activities. Tryon Park is one of the hidden delights of the city of Rochester. 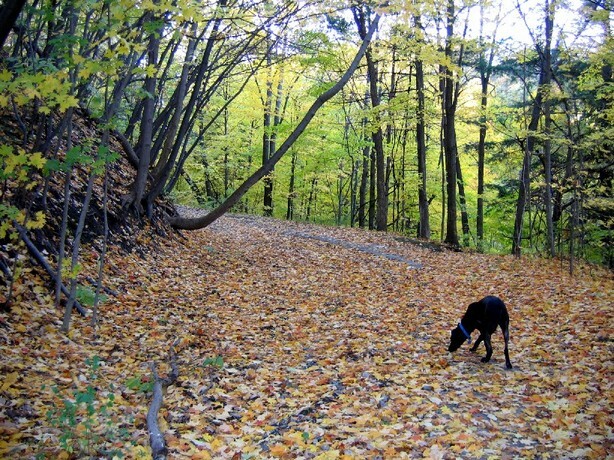 It doesn't receive much press and a lot of people don't even know it exists, which makes it one of the best secluded dog walking or hiking areas in town. The park is 82 acres of woods on the edge of the city, with the bay bordering the north. It's mainly accessible from a little side street called Tryon Park of off North Winton Road, but there is also an additional entrance elsewhere in the park. The Tryon Park entrance is on a dead end residential street with parking available in a recently (2010) created parking lot just past the little bridge that runs over I-590. The gates are closed by Monroe County Parks officials at closing time every day, so park on the bridge if you are afraid of being locked in. There are a ton of trails (not all of them obvious). Most were created on an uncoordinated basis by hikers and mountain bikers prior to the park formally allowing mountain biking in May 2011, and since then the Genesee Regional Off-road Cyclists organization, GROC, at the behest of Monroe County Parks, creates and maintains the formally recognized trails. They are always seeking volunteers to assist with trail maintenance and new trail creation. If you enter and head west you'll hit the marshes and be able to see the bay. Go east and eventually you'll hit civilization again and come across the second entrance. It's possible to wander for a solid hour without seeing much of anything other than trees and creeks, something you can't say about most other parks in the city. There's one particular creek that runs all the way through the park and I still haven't made it to the end yet! The trails are rugged, so bring sturdy shoes and grab a walking stick from the forest. There are lots of craggy hills to climb and glistening rocks to leap over. There's also plenty of weird old litter in the park. I have no idea how half the stuff I see in there even got there. Tractor trailer tire perched atop boulders in the middle of a creek? You tell me. If you want an adventure, try to find the abandoned skeleton of a car that's buried somewhere out there in the woods. If you see any obvious trash try to take some with you on your way out. It's a gorgeous wooded area, but it's gone to sprawl and could use some loving care. Please keep in mind park rules - Carry In/Carry Out. Mountain bikers yield to hikers. Everyone be courteous. 2011-04-29 12:27:33 Tryon Park is currently part of a mountain bike trial period for the Monroe County Parks dept. Unlike all other parks in the county,mountain bikes will be allowed here. The nearby Bay West park (AKA Abraham lincoln) is also part of this trial. This site says Sept. 3, 2010 was the start of the 18 month trial period. 2012-10-12 08:43:55 "Tryon Park is currently part of a mountain bike trial period for the Monroe County Parks dept. Unlike all other parks in the county,mountain bikes will be allowed here. The nearby Bay West park (AKA Abraham lincoln) is also part of this trial. This site says Sept. 3, 2010 was the start of the 18 month trial period. http://www.mygroc.com/Advocay/tryon-bay-park-west-trial-period.html —greif"
Tryon Park DOES allow mountain biking, it is the only one in Monroe County. They go to great lengths (like at Dryer Road) to design the trails to prevent erosion. 2013-11-14 12:48:34 My GF and I recently moved into this neighborhood, so we went to check out this park that we had never heard of before. Wow, what an amazing hidden treasure! You would never imagine that so much wild space could be tucked away in an area like this. The terrain is beautiful, full of ridges and valleys, and many trails that you could spend hours walking. It's a lot like the hilly part of Ellison Park towards the back. We saw perhaps 10-15 other people while we were there, including joggers, people walking and a couple pairs of mountain bikers(who weren't blazing down trails or riding dangerously, by the way). This seems like a great spot to go for a walk and to bring a dog. We'll definitely be back much more often, as this is one of the best spots to get a taste of the outdoors in the city. My only lament is that you can hear 590 through much of the park and there is a bit of litter like tires and such, particularly close to the parking lot and that area. Otherwise, you could think you were in the middle of a state park trail.